The currently visible building dates from the middle of the 1st cent. AD, but from its previous existence it still retains the ‘second style’ wall decorations at the entrance and in a room to the east of the tablinum. 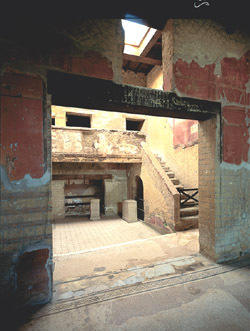 The building's layout is rather unusual: the atrium is replaced by an interior, mosaic-embellished courtyard, which acts as a landing leading to the various rooms that open onto it, and containing a staircase, with a gallery painted with ornamental motifs, leading to the upper floor. The remodelling, perhaps related to a change in the building's function (maybe a boarding school), also led to the creation of new mosaic floors in the tablinum and the adjacent room, which was also painted in ‘third style’. On the back wall of the large sitting room, perhaps used for group meals, are two neo-Attic marble reliefs representing Dawn and Dusk, found in fragments along Cardo V.